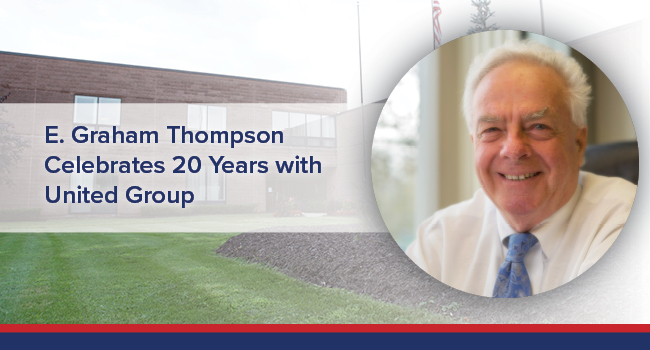 The extensive and wondrous career of E. Graham Thompson officially reached twenty years today, as United Group proudly recognizes his work ethic, commitment and wisdom for the past two decades. As Regional Commercial Property Manager, Graham is responsible for overseeing approximately 750,000 square feet of United Group’s commercial properties. He’s a trained and experienced civil engineer with over fifty years’ experience in professional real estate development and management, including commercial real estate transactions, commercial leasing, site selection, acquisitions, sales, management, development, operations, new construction, security, purchasing, budgets, environmental compliance, leasing, and training. He is also a licensed real estate broker in the state of New York. Graham is a former hockey player and hails from Nova Scotia, Canada. He spent many years working in Newfoundland, New Brunswick, Ontario, and on Prince Edwards Island before becoming a United States citizen in the 1960s. When Graham isn’t at the corporate office, dressed in his trademark apparel: white dress shirt, tie and suspenders, he’s maintaining his large collection of vintage cars, and spending time with his sons, his grandchildren, and his beloved Black Labrador. Michael Uccellini and I immediately visited two big projects in Albany, NY that I would be overseeing. Michael told me “we need to get going on these,” and I hit the ground running, no training necessary. Yes, I’m in the same role. We’ve sold several commercial properties over the years, so I’m focusing on fewer properties. I generally unlock the doors at 7:00am, sometimes even earlier. We have a bird feeder right outside my office window, so I always take a minute to feed the birds. Then I respond to emails and handle the most recent issues. I like to keep a low profile. They’ve all been pleasant memories, all twenty years’ worth. I enjoy the work, I enjoy the people, and I’ve made a lot of great friends along the way. I always love a good challenge; you never know what to expect in this line of work. 6.) What advice do you want to give yourself now, after working for the United Group for past 20 years? Twenty years will move quickly; take a minute to appreciate your time and enjoy the memories. Be thankful for the good people you are surrounded by.